WHILE the rules are clear about not mixing sports and politics, it has happened one too many times. It may happen again in Malaysia. The Cabinet will decide today whether the national football team should withdraw from the AFF Cup now being staged in Myanmar and the Philippines. Malaysia are under pressure to withdraw from the competition as a sign of protest against Myanmar’s “genocide” in Rakhine. Sports Minister Khairy Jamaluddin is caught in a difficult position. 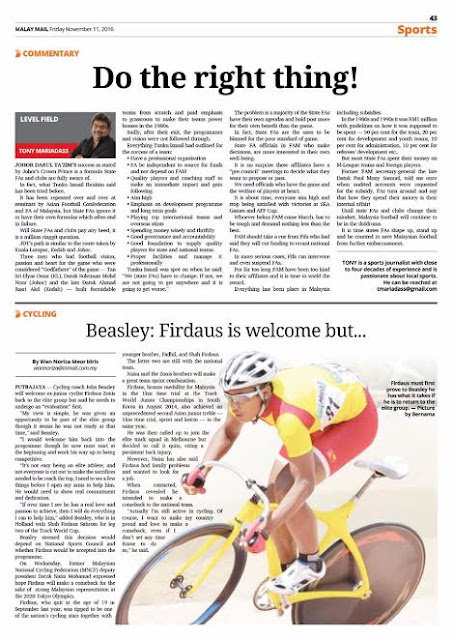 The Rembau MP said he will stay guided by the decision to be taken. It is hoped the Cabinet will weigh the situation carefully and also take into consideration the impact it will have on Malaysian sports. It is generally believed Malaysian football is still reeling from the negative effects of the government’s decision to pull out from the 1980 Moscow Olympics after the football team had qualified on merit. It was the second and last time Malaysia qualified for the Olympics. 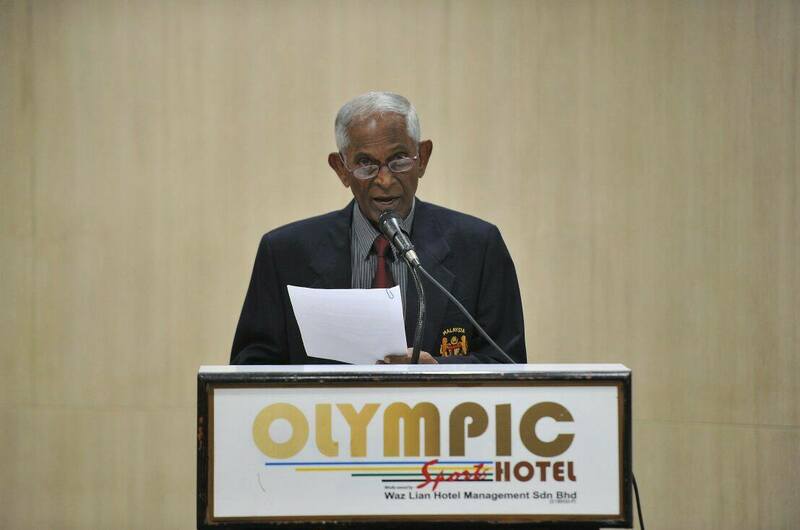 The Moscow Olympics squad team manager, the late Datuk Bakar Daud, had wished he had access to then prime minister Tun Hussein Onn to change his stance on the boycott. Malay Mail’s Johor correspondent Dan Guen Chin, a sports reporter who was covering the national team then, was told of Bakar’s wishes. “Datuk Bakar was devastated when told of the boycott. He told me he had tried to see the Prime Minister to personally make a plea for a change of heart fo the sake of sports,” Dan revealed. Indeed Bakar was spot on, as Malaysia’s football performance took a slide since then and has not recovered. Malaysia were ranked 70th then; now 156th. In the past Malaysia’s stance of not entertaining countries with whom we have no ties, has denied us host nation status for international meetings and championships. Coming back to the AFF Cup, what kind of message will we be sending to the national team and our sports performers at large if they are asked to withdraw? Surely, there are other ways the government can address the situation in Rakhine — through the United Nations, Asean, directly with Myanmar, or even give assistance for the rescue of fleeing Rohingyas. Malaysia will host the SEA Games next August, if the pullout from the AFF Cup is executed, what effect will it have on the Games? Are we going to exclude Myanmar, or are Myanmar going to pull out because of Malaysia’s action? What happens to Asean and SEA Games Federation solidarity? Are we willing to jeopardise that? Politics and sports or sports diplomacy describe the use of sport as a means to influence diplomatic, social and political relations. Sports diplomacy may transcend cultural differences and bring people together. Sport and politics should not mix just as water and oil never can. 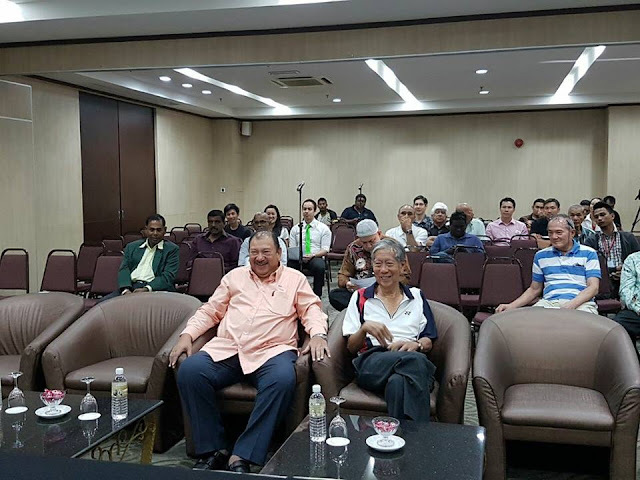 THE revived Malaysian Olympians Association (MOA) now comprise a combination of experience, young and vibrant Olympians following their Annual General Meeting last Saturday. The original MOA in 2001 under Tan Sri P. Alagendra were deregistered in 2012 for inactivity. However, S. Sabapaty and the protem committee of nine members, headed by Lt Com (rtd) Karunakarer Selvaratnam, worked for two years before MOA were re-registered with the Registrar of Societies on June 7. MOA now have more than 300 Olympians. Membership is automatic and voting members have to pay a one-time RM100 registration. While 75-year-old Karu, a double international in cricket and athletics competed in the 1964 Olympics Games in Tokyo and 69-year-old Sabapathy who competed in the 1972 Munich Olympics as a member of the relay team will provide the experience and guidance, it is the young executive council members who are expected to be the driving force. That swimmer Jeffery Ong (Seoul 1988 and Barcelona 1992 Olympics) returned after 14 years in England to be deputy president is a fresh breath of air. Together with others like Stephen van Huizen, S. Aanantha Sambu, Datuk Mirnawan Nawawi (hockey), Norseela Mohd Khalid, Roslinda Samsu (athletics), Allen Ong and Khoo Cai Lin (swimming), this committee has visions to help Malaysian sports with their experience, programmes, input and getting involved in sports administration more actively. Immediately after the election, MOA set up a Facebook page and a Whatsapp group. Karu, a former naval officer who held many administrative posts, had to make some important changes to get MOA more focused. Among them included incorporating representatives from north and south of Peninsular Malaysia and East Malaysia. MOA too needs to transfer their registration from ROS to the Sports Commissioner’s Office (SPO). MOA should actively engage with National Sports Council, National Sports Institute and Sports, Education and Higher Education Ministries. 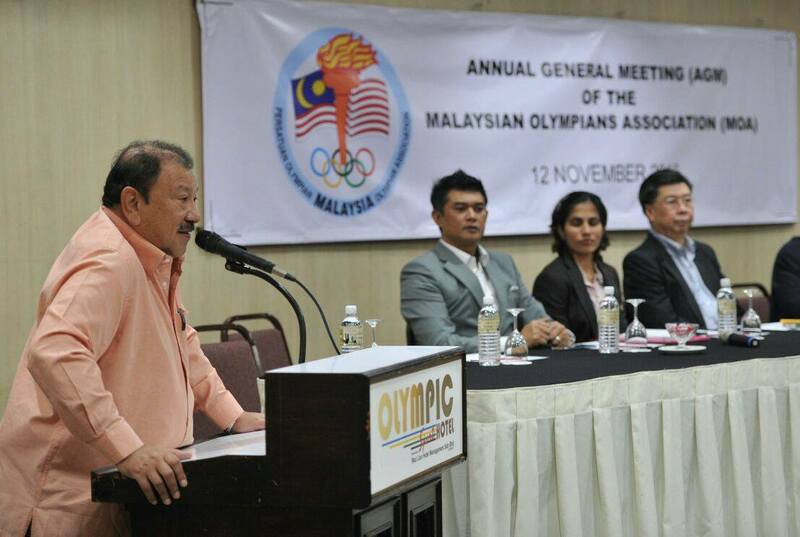 MOA are affiliated to World Olympians Association (WOA) and recognised by Olympic Council of Malaysia. WOA are recognised by International Olympic Council. Karu said their plans include blending sports with education and culture. Besides working closely with various sports agencies, they must set up coaching academies in states for various sports, be talent scouts and do development work with selected schools who serve as base of a particular sport. They should also consider setting up scholarship funds and think about acquiring medical cards. MOA also should encourage members to work closely with states and national associations and take up administrative posts to be actively involved in charting the direction of sports. We need sports persons to manage sports as they will understand it better. It is hoped MOA do become like some ex-internationals associations who are more interested in organising friendlies, going on tours and attending international meetings. MOA must also start thinking of ways to raise funds. The last thing they must do is to wait for handouts and go around begging for funds. JOHOR DARUL TA’ZIM’S success as stated by Johor’s Crown Prince is a formula State FAs and clubs are aware of. In fact, what Tunku Ismail Ibrahim said has been tried before. It has been repeated over and over at seminars by Asian Football Confederation and FA of Malaysia, but State FAs ignore it or have their own formulas which often end in failure. Will State FAs and clubs pay any heed, it is a million ringgit question. JDT’s path is similar to the route taken by Kuala Lumpur, Kedah and Johor. Three men with football vision, passion and heart for the game and considered “Godfathers” of the game — Tan Sri Elyas Omar (KL), Datuk Suleiman Mohd Noor (Johor) and the late Datuk Ahmad Basri Akil (Kedah) — raised formidable teams from scratch and paid emphasis to grassroots to make their teams power houses in the 1980s. Sadly, after their exit, their programmes and vision were not followed through. • Good foundation to supply quality players for state and national teams. The problem is a majority of the State FAs have their own agendas and hold post more for their own benefit than the game. In fact, State FAs are the ones to be blamed for the poor standard. State FA officials in FAM who make decisions, are more interested in their own well-being. It is no surprise these affiliates have “pre-council” meetings to decide what they want to propose or pass. We need officials who have the game and the welfare of players at heart. It is about time, everyone aims high and stop being satisfied with victories at SEA Games and AFF Cup. Whoever helms FAM come March, has to be tough and demand nothing less than the best. FAM should take a cue from Fifa who said they will cut funding to errant national FAs. 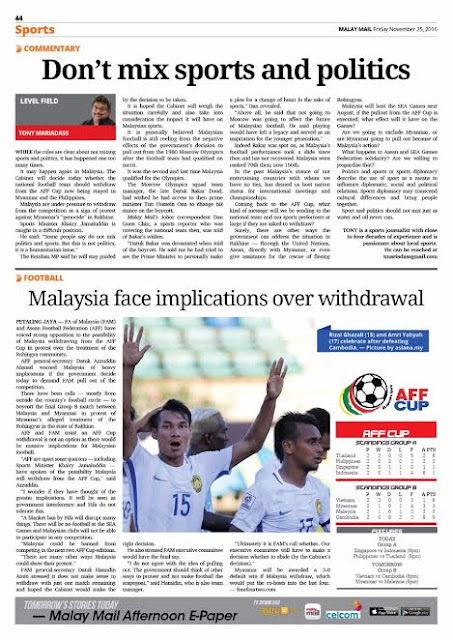 In more serious cases, Fifa can intervene and even suspend FAs. For far too long FAM have been too lenient to affiliates and it is time to wield the sword. Everything has been in place in Malaysia including subsidies. But most State FAs spent their money on M-League teams and foreign players. Former FAM secretary-general the late Datuk Paul Mony Samuel, told me once when audited accounts were requested for the subsidy, FAs turned around and said how they spend their money was their internal affair! Until State FAs and clubs change their mindset, Malaysia football will continue to stay in the doldrums. 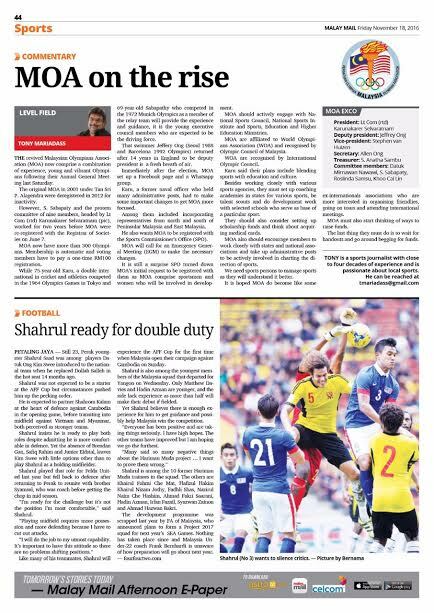 It is time State FAs shape up, stand up and be counted to save Malaysian football from further embarrassment.